The 2017 Nissan Murano adds an exotic twist to a segment not known for its stunning styling. 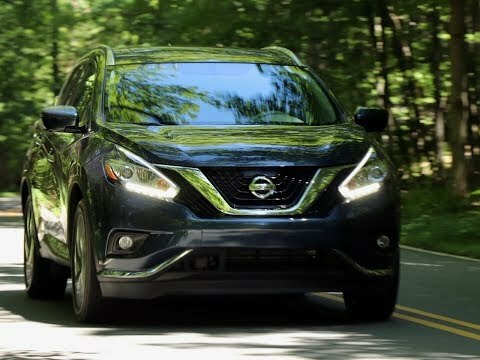 With room for five, a large cargo area and a powerful V6 engine, the Murano fulfills the mission of a midsize-crossover SUV, but its sporty ride and handling might have some comparing it to more expensive premium-crossover SUVs from BMW and Lexus. The Nissan Murano is a smooth, quiet ride. It is a comfortable ride. I am not used to the size when it comes to parking or making tight turns in some parking lots with medians. Blind spots can be a problem on the highway. It does get up and go when I need to accelerate. Great space and storage in the cabin. Love the backseats and the easy release to put the seats down so I can take my dogs out. It is a bit wide and tight squeeze to park in the garage with another vehicle. Wish it could hold 6 CD in the stereo. Overall very nice smooth ride and MPG is crazy good for an SUV. 2017 Nissan Murano is a very spacious vehicle. I personally love my vehicle. It handles very nice. The drive is incredibly smooth compared to other models such as the Nissan Rogue, which was my other choice when I was purchasing my vehicle. The backseat area has enough room to comfortably seat a full grown 6 foot man. I get very well gas mileage, about 34 miles to the gallon. I love that I am able to nicely fit a family of 5 in this vehicle plus have room for the dog in the way back hatchback area! I find this to be a very reliable vehicle overall. Great family of 4 vehicle. My Murano is the most comfortable vehicle I have owned. I really like the push start feature, but I would like to be able to start it without fully getting in the vehicle. But I should probably learn to use the remote start option better. It is very reliable. I love the way it drives on the highway and it is heavy enough to not let the wind bother you while driving too much. Perfect size for a family of 4. Love the color gray I got too with lots of chrome Accents.